SB 1094, written by Sen. Joel Anderson, would require the Victim Compensation Board to automatically approve payouts to exonerated individuals when courts use new evidence to rule that the original conviction was a mistake. Rafael Madrigal is still waiting for his money. He sat behind bars for nearly a decade until a federal judge reversed his conviction. 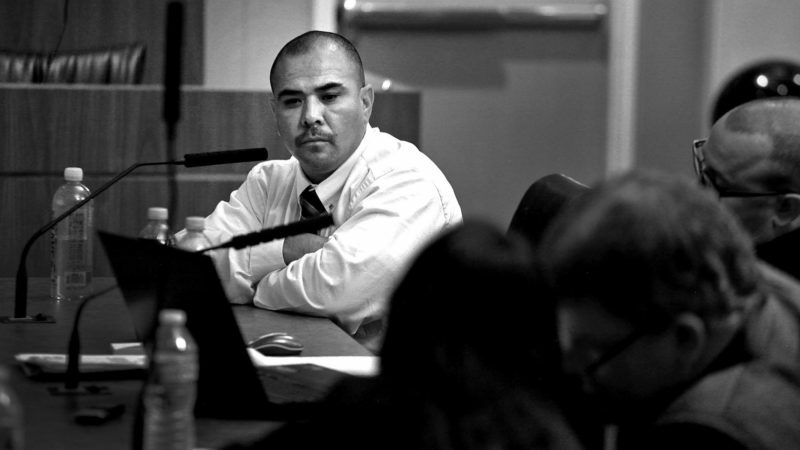 For the last nine years, Madrigal has tangled with the state for compensation for his wrongful conviction. Madrigal is crossing his fingers for the passage of a bill pending before the Legislature. If SB 1094, written by Sen. Joel Anderson, becomes law, Madrigal could be awarded approximately $471,000, and payouts would also flow to scores of other previously incarcerated people. The bill would allow the wrongfully convicted to bypass a series of bureaucratic hurdles that stand in the way of that compensation. Madrigal, now 43, was arrested in July 2000 for attempted murder in a gang-related shooting in East Los Angeles, despite the fact that an alibi testified that Madrigal was working more than 30 miles away that day. During the initial hearing, Madrigal’s defense attorney failed to introduce key pieces of evidence, including a recorded phone call in which the driver in the drive-by shooting confessed to the crime and claimed Madrigal’s innocence. Under state law, wrongfully convicted individuals are owed $140 for each day of wrongful imprisonment. Madrigal, who lives in Riverside and works as supervisor for a beauty products manufacturer, says he needs his state compensation to send his sons through college. Since his release, Madrigal has tangled with the Victim Compensation Board, a three-member panel that reviews claims and recommends payouts to exonerated individuals. The process of hearings and appeals can take years. Despite the fact that a judge reversed Madrigal’s conviction, the compensation board has denied his payout twice, based largely on a belief of guilt by a deputy attorney general. Madrigal’s most recent appeal is pending before the Los Angeles Superior Court. Anderson’s bill would require the Victim Compensation Board to automatically approve payouts to exonerated individuals when courts use new evidence to rule that the original conviction was a mistake. “This bill is trying to get rid of this weird process that we’ve injected into what should be a simple claim of wrongful compensation. Then you get your check,” said Alex Simpson, associate director of the California Innocence Project, which sponsored the bill. Simpson is also Madrigal’s attorney. The bill is not opposed by any outside groups, including those in law enforcement. It has sailed through two policy committees. It may encounter one hiccup, however, based on the amount of money the state would need to pay if it became law. That sum could be in the millions, according to a fiscal analysis of the bill. If the cost derails the bill, the California Innocence Project plans to re-introduce it as a component of the state budget. Simpson says the bill would actually save money due to the years of costly hearings paid by the state. If SB 1094 does become law, Madrigal would still need the Los Angeles Superior Court to reverse the compensation board’s ruling in order to receive his $471,000.